The debut album from UK's Lethean is an enchantingly female-vocalled mix of Epic Doom and Heavy Metal. Over two years have passed since the EP 'Hope’s Flame Burns Low' was released. 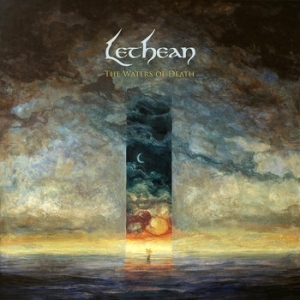 Lethean are back with 'The Waters of Death', new line up and a more creative, well written album. It is released through label Cruz del Sur Music. Multi-instrumentalist James Ashbey delivers some great guitar work and overall pushes the boundaries from previous works. Added is Thumri Paavana on vocals. Her vocals float effortlessly over the guitars. Many of James’s guitar riffs seem to showcase her vocals even more and it’s a really clever bit of songwriting. Her tone is soft yet powerfully melodic that you can’t help wanting more and each song makes her voice that more enchanting. 'Idylls of the King' starts the album off at a great pace with catchy riff work. Some of it, especially the harmonies, actually remind me of very early Iron Maiden songs, also very early Solstice James having himself been part of their lineup. No melody overstays it’s welcome so the variety is great. 'Seafarer' keeps the pace ticking along with different tempo changes adding more substance to the song. The drums are well thought out as well and don’t get in the way but allow everything to breathe nicely. You can see much evidence from these two opening songs how the rest of the album will shape up. The guitars are not over complicated and leads just add that bit of sparkle on top. 'In Darkness Veiled' brings everything down with angelic vocals and clean electric before the heaviness crushes in. It would have been nice to maybe have this longer to show variety and really let the listener soak in Thumri’s vocal’s. Personally the songs gets a bit lost for me not saying that there are no interesting parts. The next two songs Time and the Gods and 'Across Grey Waters' offer some great moments. We get our quite part in 'Across Grey Waters' which floats gracefully along. The album has so many solid riffs that it takes a few listens to really appreciate the work James has put together. Bass is played to complement each instrument nicely. It’s a warm heavy sound and resonates with Thumri’s vocals perfectly. I like the balance as well of the mix, spacing out each element to give clarity and freshness. 'Devouring Fire' brings a close to the album. At over 10 minutes this is the longest song on the album and my favourite. After devouring all of this you can easily see why the album has themes of decline, departure and the passage of time, reinforced by diverse imagery drawn from mythology, literature and the elements as described by the band themselves. It’s a great song to close out the album. The opening guitar riff is memorable and the song has a nice rhythmic balance to it. There is much to ponder on with this release and overall I think that they have both brought in some fantastic elements. It’s worth giving this a few spins to really appreciate it. I’m really looking forward to seeing what Lethean can produce going forward.